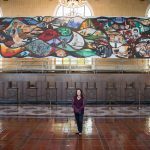 THE “UNCENSORING” OF BARBARA CARRASCO’S 1981 LANDMARK MURAL L.A. HISTORY: A MEXICAN PERSPECTIVE RETURNS TO UNION STATION SEPT. 29 FOR MONTH-LONG RUN – ¡Murales Rebeldes! 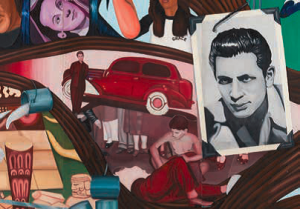 LOS ANGELES – (September 28, 2017) — Barbara Carrasco’s landmark mural, L.A. History: A Mexican Perspective, part of the exhibition ¡Murales Rebeldes! 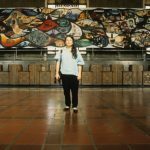 L.A. Chicana/o Murals under Siege, will be on display at Union Station for the first time in 27 years, from September 29 through October 22. The California Historical Society (CHS) and LA Plaza de Cultura y Artes (LA Plaza), the presenters of ¡Murales Rebeldes! 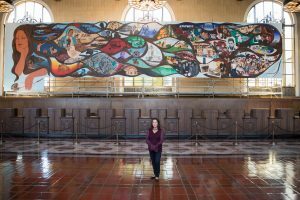 L.A. Chicana/o Murals under Siege, spearheaded the effort to bring L.A. History: A Mexican Perspective back to Union Station, one of the few places in the city large enough to accommodate it. Carrasco’s L.A. History: A Mexican Perspective was commissioned and later censored by the Los Angeles Community Redevelopment Agency for depicting a more realistic history of people of color in Los Angeles and has only been shown once in its entirety at Union Station in 1990, for the duration of two weeks. It was originally intended to be displayed at a site on Broadway in downtown Los Angeles in 1981 as part of the city’s bicentennial celebration. It contains 51 scenes depicting a chronological history of Los Angeles with an emphasis on the experiences of marginalized groups. These vignettes begin with the city’s original native inhabitants and conclude with key episodes from the twentieth century. Individual scenes include the whitewashing of David Alfaro Siqueiros’s mural América Tropical, the incarceration of Japanese Americans during World War II, and the Zoot Suit Riots, all shown as unfolding within the strands of a woman’s hair. 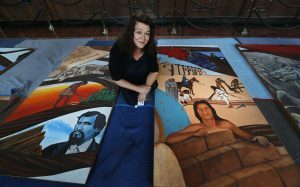 In 1981, Carrasco created the mural for the Los Angeles Bicentennial, selecting its scenes after interviewing historians and community groups about important aspects of the city’s history. Students, fellow artists, and even family members modeled for and helped construct and paint the mural. Ultimately, the mural was censored for its Chicana and feminist perspective by the very organization which had commissioned it, the Community Redevelopment Agency of the City of Los Angeles. (CRA/LA). When the agency requested that she remove 14 images, including depictions of farmworkers and urban redevelopment projects that had displaced families and communities, Carrasco refused to change her work. As a result, Carrasco’s landmark mural, comprised of 43 panels, was not shown during the Bicentennial. Except for its temporary display at Union Station for the 1990 Los Angeles Festival, it has remained unseen in its entirety and has languished at a storage facility in Pasadena. 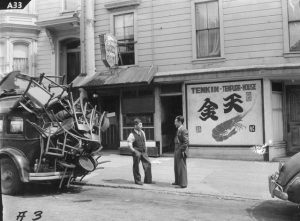 Despite being portable, the 80-foot mural is complicated and expensive to display. At Union Station, which is protected under the National Register for Historic Places, the panels could not hang directly on the walls, requiring a scaffold to be erected to hold the mural. Funding from several non-profit partners, including lead grants from the Getty Foundation and additional support from the Mike Kelly Foundation, KCET, and the Ratkovich Family Foundation, covered the expenses to bring the mural back to the public. ¡Murales Rebeldes! L.A. Chicana/o Murals under Siege, an exhibition and companion publication presented by LA Plaza and the CHS, examines the history of contested Chicana and Chicano murals through eight examples that have been censored, whitewashed, neglected and even destroyed. The exhibition is on view at LA Plaza from September 23, 2017 through February 28, 2018. LA Plaza and CHS will also conduct a series of free public programs throughout the run of the exhibition, including panel discussions with artists and mural-making workshops. The exhibition is part of Pacific Standard Time: LA/LA, an exploration of Latin American and Latino art in dialogue with Los Angeles. Major support for the exhibition and related publication is provided through grants from the Getty Foundation. Additional support is provided by the Annenberg Foundation, the Mike Kelly Foundation for the Arts, KCET, and the Ratkovich Family Foundation and with special gratitude and appreciation to Los Angeles County Metropolitan Transportation Authority, Union Station Los Angeles, and Metro Art. The exhibition and its companion publication are part of the Getty’s Pacific Standard Time: LA/LA, a far-reaching and ambitious exploration of Latin American and Latino art in dialogue with Los Angeles. Supported by grants from the Getty Foundation, Pacific Standard Time: LA/LA takes place at more than 70 cultural institutions across Southern California, from Los Angeles to Palm Springs, and from San Diego to Santa Barbara. Pacific Standard Time is an initiative of the Getty. The presenting sponsor is Bank of America. LA Plaza de Cultura y Artes is the nation’s premier center of Mexican-American culture. Providing an experience unlike any other, LA Plaza’s interactive exhibits and dynamic programs invite visitors of all backgrounds to explore as well as contribute to the ongoing story of Mexican Americans in Los Angeles and beyond. Located near the site where Los Angeles was founded in 1781, LA Plaza’s 2.2-acre campus includes two historic and newly renovated buildings (the Vickrey-Brunswig Building and Plaza House) surrounded by 30,000 square feet of public garden. The California Historical Society, founded in 1871, is a nonprofit organization with a mission to inspire and empower people to make California’s richly diverse past a meaningful part of their contemporary lives. Headquartered in San Francisco—with our Los Angeles office at LA Plaza de Cultura y Artes and our Los Angeles outposts at the University of Southern California and the Autry National Center—CHS holds one of the state’s top historical collections, including some of the most cherished and valuable documents and images of California’s past, revealing California’s social, cultural, economic, and political history and development. Through high-quality exhibitions, public programs, publications, research and preservation, CHS promotes public engagement throughout the state.